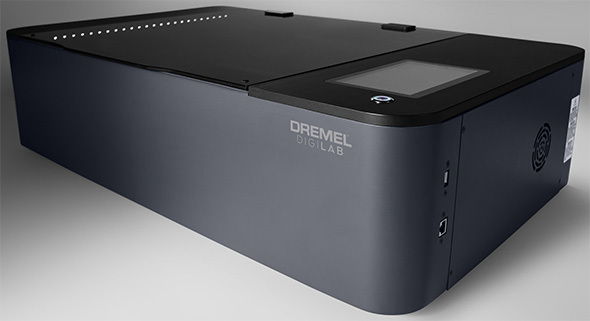 Dremel has come out with a new version of their Idea Builder 3D printer. The new Dremel 3D40-01 Idea Builder 2.0 sports a number of improvements and enhancements compared to their first generation model. I had a brief opportunity the new Dremel Idea Builder 2.0 in action, and while it can be quite boring to watch a 3D printer do its thing, I noticed a few nice touches compared to some of the other 3D printers I’ve seen in videos or observed at Maker Faire. More on that later. In the meantime, here’s a quick look at what it offers. This is a PLA filament printer. They say that leveling should be easier than before. New Dremel MM35 Oscillating Tool First Impressions: Dremel Digilab 3D45 3D Printer New Dremel… Laser Cutter? A Stanley Black & Decker 3D Printer? No thanks. Not even close. Bed is not heated. Build volume is too small. Print resolution is too low . Filament is WAY overpriced. Much too expensive. You can easily buy much nicer printers for less than $1k. I’d gladly buy a makerfarm machine instead of this. You can easily buy much nicer printers for less than $1k. Maybe? you are defining nice by what features it has. Another way to look at it is how bulletproof or foolproof the printer is. If I can truly load a design, load the filament and hit print — then come back in a few hours and have my print. And do that every time. That’s worth some money to a lot of people. Not to mention for small parts a printer can print too fast, the last layer doesn’t cool enough before the next layer is applied — that’s why I’ll print at least two of a small object. Does the Dremel do the above for you? I don’t know. If it had all that dialed in it might be worth it. I’ve spend literally days trying to dial in the above parameters. Don’t even get me started on different filament materials and bed temperature. Trying to 3d print without any tweaking is unrealistic for ANY FDM printer. …And I’m including Stratasys printers here. Wish it could use ABS. Other printers are available that don’t cost as much. I suppose the idea that it’s a well known maker will appeal to some. The only one sold through home depot or lowes will probably make them money though. there are better products out there so it is a bit sad this is so weak. but I can see it now – displayed at Lowes for ____________. with a filament kit pack. Honestly, I’m disappointed that the engineers at Bosch couldn’t come up with a printer that might actually shake things up in the 3d printing world. 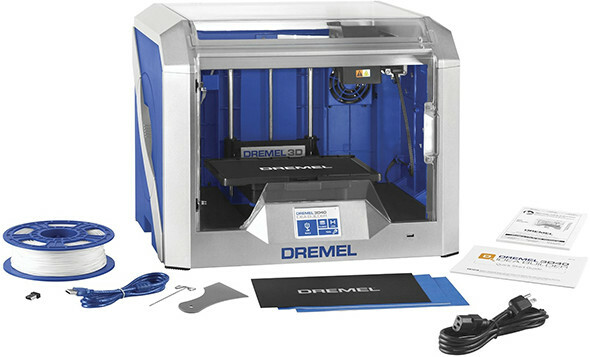 This strikes me as a quick money scheme from Dremel. Get some piece of junk on the market quickly just to get the uneducated masses’ money. I think this is going to be a decent option for people to get their feet wet in 3D printing and are intimidated. There is no doubt that there are other options out there with more capabilities and options. I’m guessing that those printers are going to have a steeper learning curve than the Dremel for those people who have zero experience. I started with an Ultimaker 2 which is an expensive setup, however it got me printing quickly with quality prints. With my experience now, I wouldn’t have any issues spending a little less for something that may need a little more tinkering out of the box. Pair this sucker up with the Dewalt PPS portable power station and you can create fishing bobbles on the fly! Use the filament as a backup fishing line. Excited about the possibilities of these things but still patiently waiting for more of a standardized industry for filaments, schematics, and everyday uses. What?!? I can watch a 3D printer for hours. It’s fascinating what paths the slicer chooses. Dremel shouldn’t be doing 3D Printing. They should be keeping to Rotary Tools and the Moto Saw that made them famous in the first place. Bosch has seriously screwed up this company’s goals. First off… 3D Printing 101 says that keeping the filament inside the work area leads to more defects, because the heating element can warp the contents of the spool before it gets used. So… Fail… for the Dremel. Next… A “Feature” is a See-Thru Lid? Y’know what many other, better 3D Printers do? Open walls. Moot point… Fail again..
Y’know what? I’m not continuing here… I love Dremel Rotary Tools, and I don’t want an excuse to be angry at the company. Have you actually used this machine or you are just saying what you have seen on the big internet? I have a 3D40, before that i had an Ultimaker2, and overall I’m much happier with the Dremel one..
I’m also glad that my printer is closed like many other more expensive printers as i can cleary notice the difference in the noise level while printing with open lid vs. closed. $1299 + Free shipping…….Whoopy Do! Not only can you buy better machines at around half that you can buy twice as much filament for the same price or less from other people. What Drew M said “Honestly, I’m disappointed that the engineers at Bosch couldn’t come up with a printer that might actually shake things up in the 3d printing world. This strikes me as a quick money scheme from Dremel. Get some piece of junk on the market quickly just to get the uneducated masses’ money.